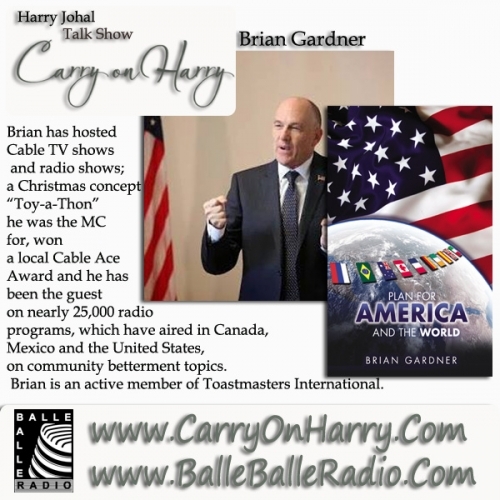 Studio Carry On Harry Talk Show guest Brian Gardner Award-winning journalist, author, performer shares his ideas about making world a better place through his initiative The 1- Hour - A - Week - Campaign for Community Betterment. He alos discussed his new book "Plan for America and The World"
“I’ve started this campaign to encourage people to invest in their communities by devoting at least 1-hour of their personal time to some type of volunteer activity. It’s called: The 1- Hour - A - Week - Campaign for Community Betterment. Everyone can devote at least 1 hour a week towards the variety of actions that come under the heading of volunteerism. One can read to a child, help out at your child's school, or just be a friendly companion to a senior citizen. When taking a walk, one can bring a bag along and pick up trash. People are always needed to do a variety of tasks for community service organizations. Pick the one you would like to volunteer for and give them a call. I am sure they will gladly take your 1 hour a week of donated time! The “list” of things that people can do is virtually endless.” said Gardner. In 1969 he purchased his first drum set and has played drums ever since. He also has a collection of percussion instruments from around the world, taught himself to play guitar and to date, has release one album of his original songs titled, “Songs of a Lifetime and Other Tales.” He has written over 50 songs. He has done over 250 performances of his one man Music-Comedy-Variety show, at retirement homes. Brian has hosted Cable TV shows and radio shows; a Christmas concept “Toy-a-Thon” he was the MC for, won a local Cable Ace Award and he has been the guest on nearly 25,000 radio programs, which have aired in Canada, Mexico and the United States, on community betterment topics. Brian is an active member of Toastmasters International. Brian has been a Star Trek fan, since the first episode aired in 1966. As a young boy he loved auto racing, (he still is a Motor Sports fan).